Some datasets have multiple vector components measured for each location, like the East and West components of wind speed or GPS velocities. 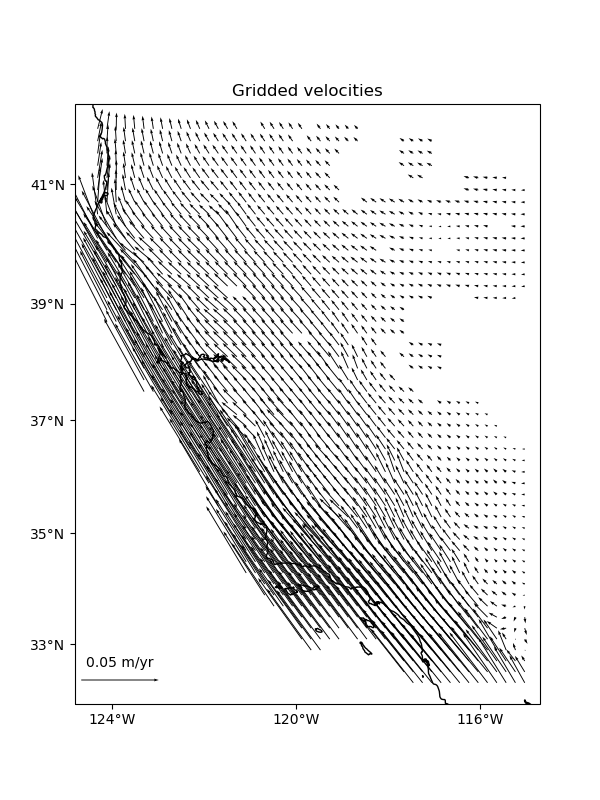 For example, let’s look at our sample GPS velocity data from the U.S. West coast. Verde classes and functions are equipped to deal with vector data natively or through the use of the verde.Vector class. Function and classes that can take vector data as input will accept tuples as the data and weights arguments. Each element of the tuple must be an array with the data values for a component of the vector data. As with coordinates, the order of components must be (east_component, north_component, up_component). Operations with verde.BlockReduce and verde.BlockMean can handle multi-component data automatically. The reduction operation is applied to each data component separately. The blocked data and weights will be returned in tuples as well following the same ordering as the inputs. This will work for an arbitrary number of components. 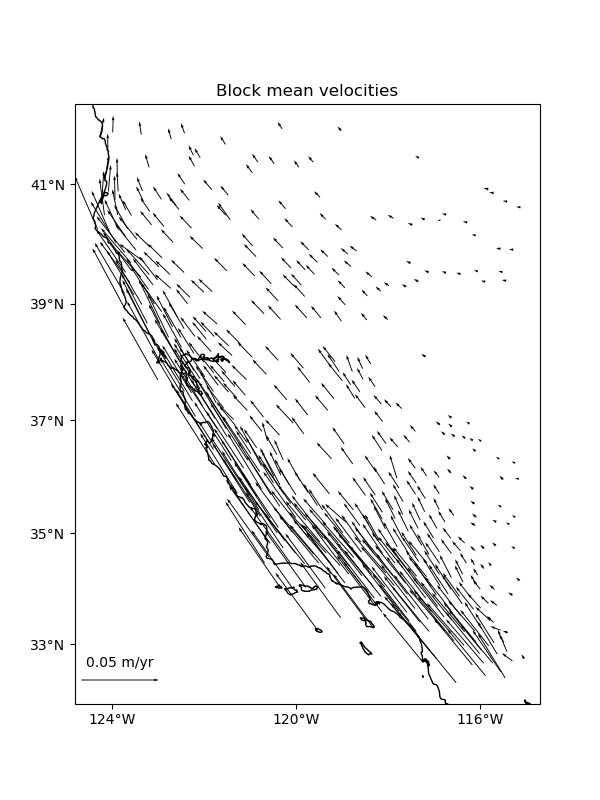 We can convert the blocked coordinates back to longitude and latitude to plot with Cartopy. 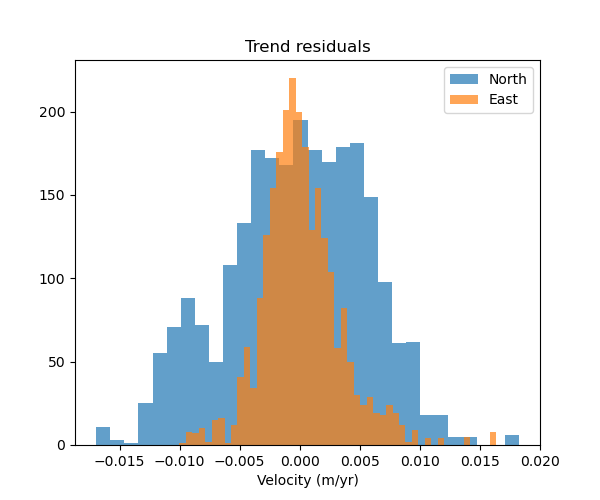 Trends can’t handle vector data automatically, so you can’t pass data=(data.velocity_east, data.velocity_north) to verde.Trend.fit. To get around that, you can use the verde.Vector class to create multi-component estimators and gridders from single component ones. Vector takes an estimator/gridder for each data component and implements the gridder interface for vector data, fitting each estimator/gridder given to a different component of the data. We can use the trend as if it were a regular verde.Trend but passing in 2-component data to fit. This will fit each data component to a different verde.Trend. When we call verde.Vector.predict or verde.Vector.grid, we’ll get back predictions for two components instead of just one. Each prediction comes from a different verde.Trend. 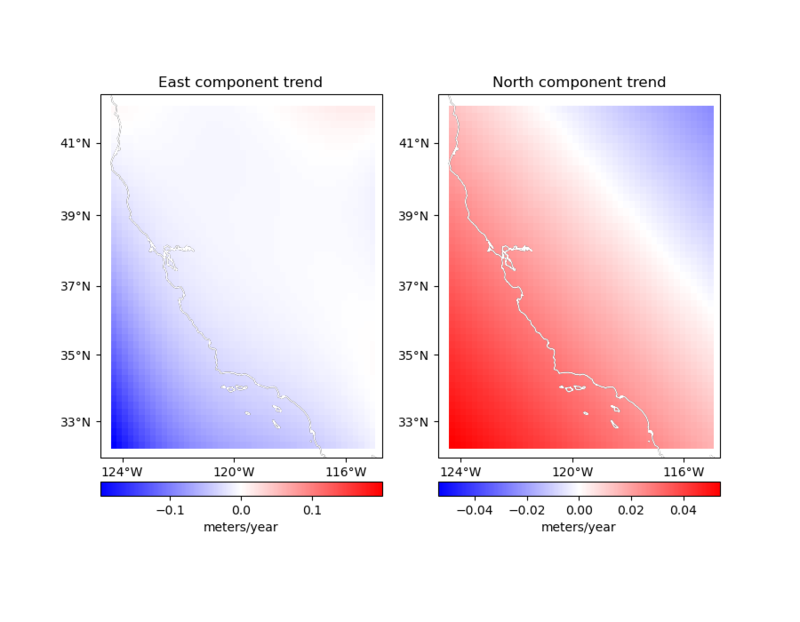 As expected, the residuals are higher for the North component because of the lower degree polynomial. Let’s make geographic grids of these trends. By default, the names of the data components in the xarray.Dataset are east_component and north_component. This can be customized using the data_names argument. Now we can map the trends. You can use verde.Vector to create multi-component gridders out of verde.Spline the same way as we did for trends. In this case, each component is treated separately. We can start by splitting the data into training and testing sets (see Model Selection). Notice that verde.train_test_split work for multicomponent data automatically. Now we can make a 2-component spline. Since verde.Vector implements fit, predict, and filter, we can use it in a verde.Chain to build a pipeline. We need to use a bit of damping so that the weights can be taken into account. Splines without damping provide a perfect fit to the data and ignore the weights as a consequence. Never generate the component gridders with [vd.Spline()]*2. This will result in each component being a represented by the same Spline object, causing problems when trying to fit it to different components. Fitting the spline and gridding is exactly the same as what we’ve done before. Mask out the points too far from data and plot the gridded vectors. Another way of gridding 2-component vector data is using verde.VectorSpline2D. This gridder uses linear elasticity theory to couple the two vector components. The degree of coupling can be controlled through the poisson parameter which sets the Poisson’s ratio of the elastic medium. VectorSpline2D generally gives better results when gridding GPS velocities, particularly for higher density grids and areas with sharp changes in velocity [SandwellWessel2016]. Here, we won’t see a big difference because of the low-density grid that we’re making.